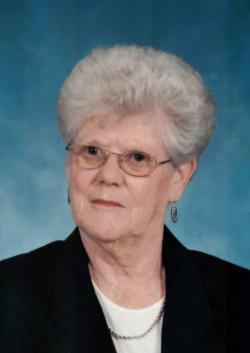 Grant, Anne Laura, age 88 of Antigonish passed away on March 16, 2019 at R.K. MacDonald Nursing Home. She passed as she lived, quietly and gently, surrounded by her family and those who cared for her and who showed great love and compassion for her. Born in Antigonish on February 27,1931 and raised in Sylvan Valley, she was a daughter of the late Margaret Janet (Chisholm) and James Archibald MacDougall. Anne lived her life in Antigonish, attended Mount Saint Bernard College, and married the love of her life in August 1953. She was foremost a mother, a wife to Louie for 45 years, a grandmother, great-grandmother, a life long friend to her sister Bernadette; and a friend to many others. Anne was a stay at home mother until her seven children had grown. She loved and cared for her family deeply, especially her grandchildren, Gramma Grant has a special place in their hearts. Until her retirement in 1996, she was receptionist at the Aquatic Pool at St. Francis Xavier University. After her retirement, she and dad continued to enjoy life travelling, camping, skating and just being together. Her faith and prayer were important to her and stayed with her to the end. Since 1955, she was a member of St. Ninian CWL. She volunteered with numerous organizations and she had the honor of being Silver Cross Mother. Since her diagnosis in 2010, Mom remained humble, kind and thankful. Even during her illness, she never forgot "please and thank you". Anne is survived by her children Danny (Sharon), Calgary, AB; Billy (Bernadette) Brierly Brook; Anne Marie (Joe) Durant, Pomquet; Louise (Arnold) VanHeighton, Deseronto, ON; John (Donna), Cochrane, AB; Janet (Jerome) MacPherson, Antigonish; daughter-in-law Sylvia Grant, Victoria, BC; Her grandchildren: Danielle, Jared, Gizelle, Cale, Nicki and Alex Grant; Cindy and Laura Durant; Shannon, A.J. and Grant VanHeighton; Cheryl Anne, David and Lewis MacPherson; and great-grandchildren: Payton and Carson McNulty; and Max Jordon; sister Bernadette (John) Landry; sisters-in-law Mary MacDougall and Inez Grant, along with many nieces and nephews. Besides her parents, she was predeceased by her husband Daniel Lewis (1999), son Colin (2011), brothers: James, Billy and Roddie MacDougall. Mom will be remembered, missed, mourned, and never forgotten. Burial in St. Ninian Cemetery at a later date.